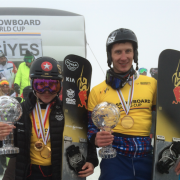 PGS in SCUOL/SUI: SG PRO TEAM rider Tim Mastnak (SLO) earns his first crystal globe! With the door open for him, Slovenia’s Tim Mastnak did not let the opportunity get away, riding a strong race to finish the day in sixth place and finish the season in top spot and in possession of the PGS small crystal globe, with 3,336 points to Prommegger’s 3,070. “It’s amazing. It’s unbelievable,” Tim laughed after the awards ceremony, “I didn’t want to think about this globe before the race today, but it happened and I’m really, really happy. There are so many good riders out there, every race a new guy can step up and win, so for me to finish the season as the best overall PGS rider is really cool.” We are happy too, Tim! Congratulations for you! You are great!